macOS Sierra's Calendar support has robust features that may suit your needs. Server’s calendar service is one of my favorite features in the Server app and the one most likely to fly under your radar. When you think about hosted calendar services your mind likely drifts to Google, iCloud, or Exchange, but the Server app’s calendar service offers more features than you may be aware of and gives you the benefit of keeping your business’ private calendar information secure and within the walls of your company. 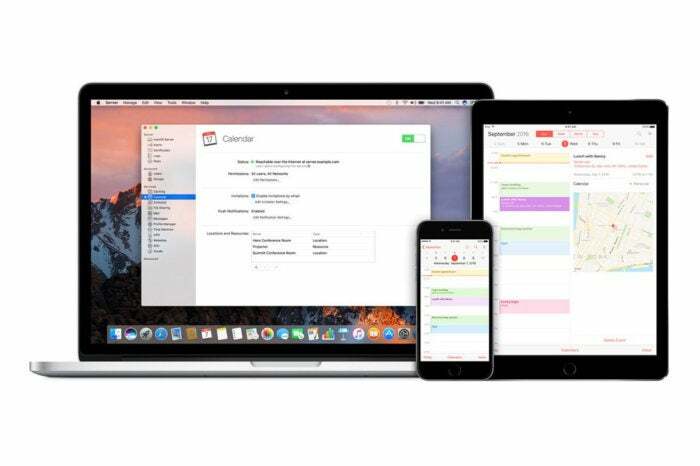 In addition to the usual calendar fare, Server’s Calendar service lets you manage resource schedules (say, conference rooms and projectors), delegate calendar responsibilities to surrogates, offers automatic schedule checking for all invited attendees, including resources, allows file attachments, private event annotations, and uses Apple’s push notification services to update events. In short, it’s a pretty robust hosted calendar that’s likely to fit most of your needs. As is the case with so many of Server’s features, the Calendar app is simple to get up and running. Select the Calendar service in the sidebar of the Server app. If you’re using an Apple AirPort in your network and you set Server up to configure your AirPort to allow access to your server’s services from the internet, you may see a message asking if you want server to configure your AirPort. If you want access to your hosted calendar outside your network, click Allow. Otherwise click Don’t Allow. That’s all that’s necessary to get the Calendar service started, so let’s see if it works. Before you set up the calendar you need to make a determination whether you want to access your calendar only from inside your private network or from anywhere on the internet. To access your server and calendar data from the internet you need to know your external IP address or fully qualified domain name (FQDN). Inside your network, if you’re on the same subnet as your server, you don’t. Select your server in the sidebar of the Server app. Make note of the IP address your server says services are reachable at. Select the Internet Accounts preference. Click the + button at the bottom of the Internet Accounts preference. Scroll down to the bottom of the list of pre-configured services and click Add Other Account. Select your server from the list of available servers or click Other if you don’t see your server in the list or if you want to access your server over the Internet. Enter a user name and password (you will also need to add an IP address or FQDN if you selected Other). Select Calendars and Reminders from the list of your server’s services. Open the Calendar app and locate your server’s calendar in the list of calendars. Now that you’re connected to your calendar, let’s create some resources and create an event. Click the + button below the Locations and Resources window. Choose Location from the Type menu. Give your room a name. Add an address and note that a map of the location appears. Select Accept If Free, Decline If Busy in the Scheduling field. When you’ve entered all your information, click Create. Next, create a new resource following the previous steps, but note that you don’t need a location for a resource. Select your server’s calendar in the sidebar of the Calendar app. Double-click a calendar date to create an event. Give the event a name. Click the Add Invitees field. Begin typing the name of one of your two resources and a list should appear with the name of your resource. Click the Check Availability button and confirm that you and the projector are available on the time and date you selected. Click the Add Location field underneath your event name. Begin typing the name of the location you created. Select your room from the list. When you’ve completed entering all your information, click Send. As soon as you click Send your resource and room will accept your invite and be made unavailable to other users and your schedule will be blocked as unavailable for anyone who wants to schedule a meeting with you. Next, we’ll spend more time with the Calendar service and look at how to delegate other users to manage your calendar and how to handle more complicated resource scheduling.